Once you start, you can’t stop! The ultimate bike riding action game! The Bike Rider series is a platform action game taking the player over bumpy roads, through valleys and jumping over all kinds of obstacles. It is a popular classic casual game that can be played on cell phones, smartphones, Nintendo 3DS and PS VITA! The original first Bike Rider game was released in Japan for cell phones in 2006, and the entire series totaled over 20 million downloads so far. As a smartphone game, it ranked first place in the App Stores race game ranking in over 44 nations including the US, exceeding 5 million downloads. Furthermore, the series ranked No.1 in sales twice in the Nintendo 3DS eShop and has been crowned the most downloaded game of 2013 in Japan. The Bike Rider series is characterized by simple one-button controls, and various kinds of gameplay have evolved from here, such as a stage-type game clearing fun levels around the world or the Grand Prix type "Bike Rider GP" in which the player competes with other players. 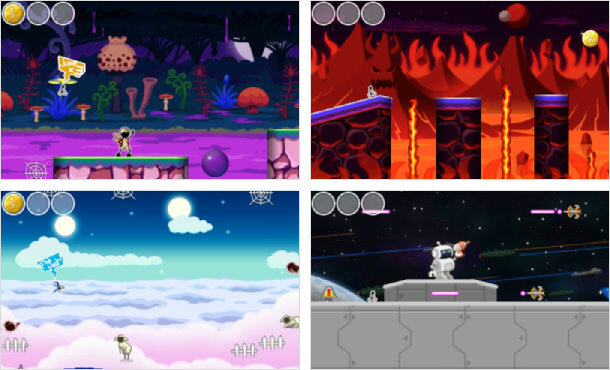 The game was picked up by the official NTT docomo, au and Softbank mobile portals achieving 15 million downloads for the cell phone version alone. Users can still enjoy the earlier versions of the Bike Rider series using the AppliGet DX service or unlock them in the PS VITA version of Bike Rider DX. Nintendo 3DS and PS VITA editions that evolved from mobile. The evolved version of the famous Bike Rider grabbed the hearts of 20 million players worldwide and can be played simply with just a tap. A fun load of weird gimmicks and items scattered around the world in a series of stages take the player on a fun adventure, including also collaboration stages with famous Japanese music unit capsule, dance music artist RAM RIDER, and the popular YouTuber HIKAKIN, which have gained great popularity. Nintendo 3DS and PS VITA editions that evolved from mobile are enjoyed by many players throughout the world. Ensuring plenty of fun for everyone who played the previous games. Bike Rider DX2 Galaxy offers two modes: The GALAXY TOUR, in which bike riders travel through a crazy galaxy of 12 planets, passing along more than 90 stages filled with dangerous obstacles, weird gimmicks and a bunch of cool power-up items, and the GRAND PRIX, in which players compete with other players in Japan in an online ranking to see who rules the Bike Rider galaxy. New features have been introduced to the series in this game, one of them being the frog rider power-up that allows the player to perform extremely high jumps, and a drill rider that can crush rocks on its way through the stage. Also the number of obstacles and gimmick items has been increased, ensuring plenty of fun for everyone who played the previous games as well as those new to the Bike Rider series.